How many of our emails should we know about the moment someone decides to email us? 205 billion. That’s the number of emails we sent and received in 2015, and that number is expected to grow to 246 billion by 2019. What does this mean for most of us? A steady stream of new messages coming into our inboxes throughout the day. And for most of us, it seems to be a norm to keep our inboxes open throughout the work day. We focus on the tasks we have at hand, and each “ping” from our inbox draws our attention, even if briefly, before we return back to our work. The problem here is the high cost of interruption. This cost includes three categories: 1) time cost 2) performance cost 3) stress/ emotional well-being. Time Cost In terms of time cost, researches have shown that any switching between tasks results in a loss of time. In other words, “multi-tasking” is a misnomer – we aren’t actually doing two tasks at once. We are doing one task, switching to the other, and then switching to the original task. One study showed that after switching tasks, it took an average of 23 minutes and 15 seconds for people to get back to their original task. Performance Cost It should be no surprise to us that distraction can cause reductions in cognitive performance. In psychological terms, “task-irrelevant thoughts,” that is – thoughts that are unrelated to the task at hand, have indeed been shown to have deleterious effects on performance. A recent study published in The Journal of Experimental Psychology illustrates how this plays out for cell phones in particular, focusing on the distraction that cell phone notifications can create. In this study, participants were tasked with completing a task involving seeing items and pressing a button every time the item was a digit from 1-9, unless it was the number 3. Some were interrupted with notifications and others were not. The study found that the notification groups were more likely to make errors than the no-interruption group. Stress/Emotional Well-Being A third factor to consider with interruptions is the effect they have on people’s well being. Task switching is fatiguing for us; it depletes us. One study showed that interruptions resulted in higher feelings of stress, pressure and effort. At this point, it should be painfully clear to us that we need to be worried about the interruptions-economy. What value interruptions provide, under what conditions, and what are their costs? A little ping may seem innocuous, but there is cumulating evidence that the cost of an interruption is higher than we realize, and of course given the sheer number of interruptions, their combined effect can very quickly become substantial. If email interruptions can have all these negative effects, what can we do to reduce them? The first thing we should question is this idea that all emails are created equal. Should each email be able to interrupt people? Is the email from someone’s boss as important as the weekly industry newsletter he’s signed up for? What if we designed a different system in which emails were not treated equally? 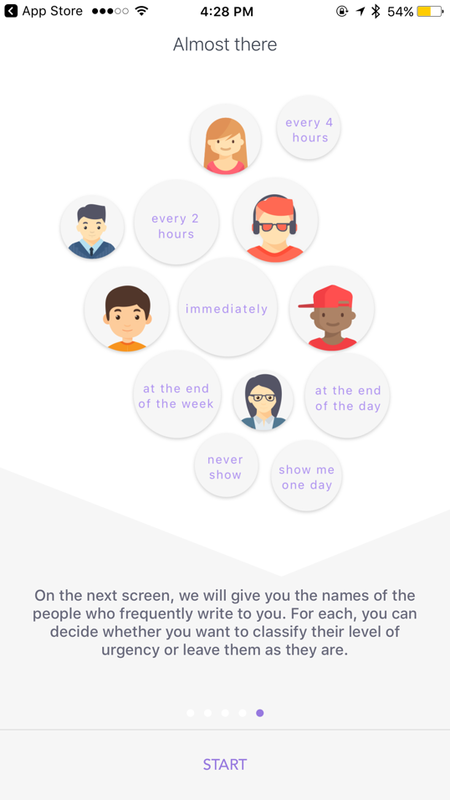 In a previous study, we looked at how many emails truly are worthy of interruption. We asked people to look at the last 40 emails they received and asked them how soon they really needed to have seen each email. Immediately? At some point today? At some point this week? At some point this month? No need to see it at all? As it turns out, very few – only 12%! – of emails need to be seen within 5 minutes of being sent. 7% of emails need to be seen within 1 hour, 4% within 4 hours, 17% by the end of the day, 10% by the end of the week, 15% at some point, and a whopping 34% fell into the “no need to see it” category. With that initial starting point – the idea that very few emails need to be seen right away – we set out to build a tool to allow people create rules for receiving emails. We used a very simple sorting technique: sorting emails based on the sender. In other words, depending on the sender, emails could be set to be received at different intervals. No complex AI or learning mechanisms. What did we find? People proceeded to create rules based on senders. Similar to our initial findings, only 23% of emails were set up to be in the “immediate” category. 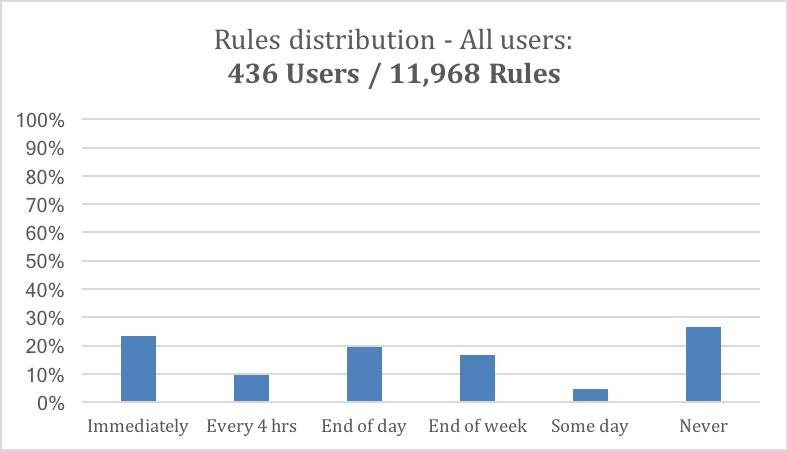 10% were relegated to the every-4-hours category, 19% to the end of the day, 16% to the end of the week, 5% to some day and a whopping 27% to the “never” category. We also looked at whether people who received high vs, low quantities of emails behaved differently. 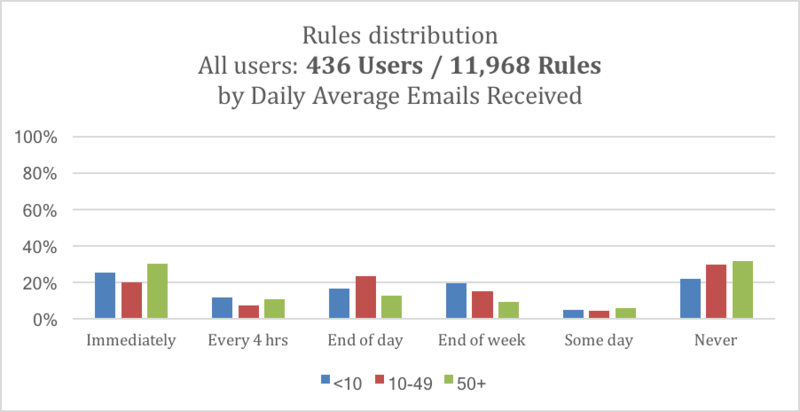 While on the whole they had similar behavior, one interesting point of note is that people with 50+ emails/day put highest number of emails into “immediately bucket” (30%) vs. 10-49 emails/day (20%) and <10 emails/day (26%). Overall, the key point and opportunity we should take away from all of this is that a very simple mechanism can have an impact, creating a significant amount of benefit for people. 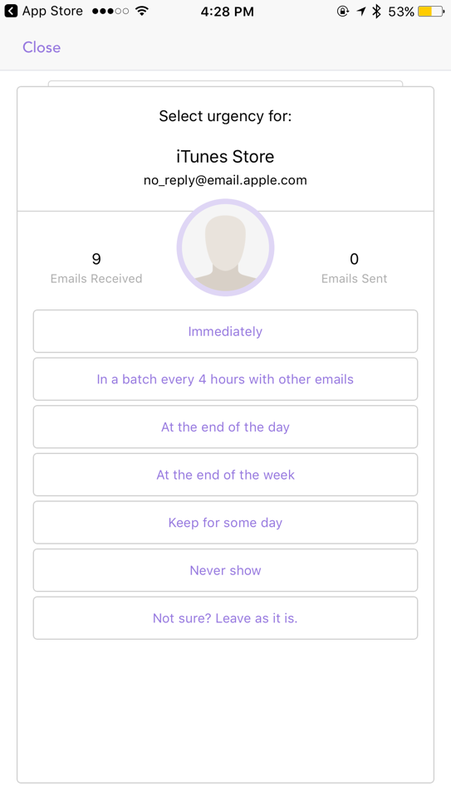 If you’d like to try this app for improving your email process for yourself, you can download it here.